Since 1973 civil supersonic transport has been banned over the United States, hindering private sector research and development. It's time for the FAA to end its ban and create a supersonic noise standard to allow aviation innovation to flourish. Aviation speeds have stagnated. In the first half of the 20th century, the United States led the globe in developing better and faster aircraft. Commercialization led many to conclude that a world of widely available and affordable supersonic flights from New York to L.A. in two hours was just around the corner. In 1903 Orville Wright piloted the first powered flight at a speed of 7 miles per hour. Forty-four short years later, Chuck Yeager broke the sound barrier at 700 miles per hour in the Bell X-1 with the help of a rocket. Then in 1958 an unassisted fighter pilot reached twice the speed of sound, 1400 mph or Mach 2. A decade later and Mach 2 speeds were commercialized in the form of the Concorde, the French- and British-made supersonic passenger jet that flew its milestone transatlantic flight in 1969. That's right: We went from two brothers with a rickety wooden bi-plane to a 100-person, Mach 2 passenger jet in about sixty years, while in the sixty years hence we've actually regressed. Instead of improving on supersonic transport by reducing costs and increasing options, in 1973 Congress and the FAA bowed to the pressure of anti-Concorde activists by issuing a complete ban on civil supersonic flight overland—a ban that exists to this day. In turn, private sector investment into quiet, affordable and environmentally sustainable supersonic technology was hobbled indefinitely. Today, the only existing commercial supersonic jets collect dust in museums. The time has come for the FAA to end its ban and create a supersonic noise standard that will allow aviation innovation to once again flourish in the United States. This site serves to answer frequently asked questions about supersonic transport, and bust some myths along the way. When an aircraft exceeds the speed of sound the air it displaces compresses into a shockwave. We know it as a "sonic boom" for the explosive noise that can be heard when it reaches the ground. In 1973 the U.S. outlawed civil supersonic flights over land for fear that sonic booms posed too great of a public nuisance. Today, technology has advanced to all but eliminate the "boom" from sonic booms. With the aid of new light weight materials and sophisticated aircraft designs, a low-boom jet is capable of producing a boom measuring less than 80 decibels. This is 100 times quieter than the Concorde, or about as loud as a motorcycle driving by. This technology could in principle be deployed today, however the ban remains in place due to regulatory inertia. Many people mistakenly believe a sonic boom is a discrete, one-off event that occurs the moment an aircraft reaches the speed of sound. In fact, a sonic boom is really two booms, but they happen so close together we only hear it as one. The pocket of over-pressure at the front of a supersonic aircraft creates a corresponding pocket of under-pressure near its rear. By the time the shockwave reaches the ground it coalesces into an N shape, with air pressure rising sharply only to dip before sharply returning to normal. The human ear perceives the loudness of a noise based on its suddenness, so the sharp peak and trough of the N-wave is what puts the "boom" (or booms) in "sonic boom." Once an aircraft is supersonic the shockwave is continuous in its wake not unlike the waves made in the wake of a boat, only these waves propagate out in a three-dimensional cone. Where the edges of the cone reflect off the ground defines an area known as the boom carpet. The width of the boom carpet grows approximately one mile with every 1000 feet of altitude. Thus if a supersonic aircraft is flying at 50,000 feet its sonic boom reaches a 50 mile width below its flight path. Focused booms, on the other hand, are discrete events at particular points in the flight path. Focused sonic booms occur when the aircraft makes a maneuver that amplifies the shockwave, but are easily mitigated with an offsetting maneuver, such as decelerating into a turn. MYTH: Sonic Booms Will Always "Boom"
The Concorde's sonic boom reached 100-110 decibels, and sounded like an explosion going off. In contrast, an overland noise rule would require supersonic aircraft to make no more noise than what we already find reasonable. Since decibels are on a logarithmic scale, a noise limit of 80 decibels, say, would allow supersonic jets overland that are roughly 100 times quieter than the Concorde. It would sound about as loud as a lawn mower or motorcycle, and only last about half a second. How is this possible? Before, testing the aerodynamics of a new aircraft was painstaking, requiring the costly use of real models and wind tunnels. Aircraft designers have since taken advantage of computer simulations to discover wing and body shapes that alter the way the aircraft displaces air. Shapes that blunt the points of the N-wave decrease perceived loudness substantially. In the limit, the N-wave can be shaped into something close to a sine-wave, making the "boom" nearly inaudible to people on the ground. Such low- and no-boom designs have already been tested in the field, and NASA's Langley Research Center maintains a demonstrator for visitors to experience the amazing contrast between an explosive boom and the soft "thump" of the most advanced designs. Modern designs use a number of other strategies to reduce boom intensity. This includes use of carbon fiber bodies to reduce the aircraft's mass, flying at high altitudes where the atmosphere is thinner, and shaping the aircraft to displace the air as if it were more elongated than in actuality. Measurements from JAXA's 2011 low-boom experiments. Plans from the Oklahoma City sonic boom tests. Unmitigated sonic booms can cause windows or old plaster to crack, but for civil applications this is extremely rare. The intensity of a sonic boom can be measured in pounds per square foot (psf) of air pressure. Buildings in good condition can withstand shockwaves up to 11 psf without experiencing damage. The Concorde's boom produced less than 2 psf, which posed a minor risk to historical structures and structures with existing compromises, but not more than natural weather events. A low boom SST would, by definition, produce a significantly softer shockwave than even this. The myth that sonic booms easily cause building damage likely dates back to an infamous series of tests conducted in 1964 under FAA supervision wherein supersonic fighter jets flew over Oklahoma City eight times a day for six months. In the end 73% of surveyed residents said they could tolerate the booms indefinitely. Nonetheless, the U.S. government received over 15,000 complaints and nearly 5000 damage claims. When most were rejected as spurious it fueled a public-relations disaster for the FAA and supersonic overland more generally. The size of the foregone market caused by the ban on supersonic overland is difficult to estimate precisely. At a first approximation, there are nearly seven domestic passenger flights within the U.S. for every international flight, but how much of the U.S. domestic market is accessible to supersonic depends on the scenario one considers. A larger passenger jet may only be practical for high-traffic, coast-to-coast routes, while small business jets are likely economical at much shorter distances, as well. In the business jet category alone, estimates of market size average between 180 to 450 aircraft in the first ten years of overland supersonic becoming legal. Elon Musk has argued that high-traffic city pairs that are more than about 1500 km or 900 miles apart are best served by supersonic air travel, adding that “a quiet supersonic plane immediately solves every long distance city pair without the need for a vast new worldwide infrastructure.” As it happens, 900 miles is roughly the average non-stop distance flown per departure on U.S. airlines, suggesting the foregone domestic market is quite large indeed. The Concorde flew for 27 years without making profit, leading some to suspect supersonic transport can't be commercially viable more generally. Yet the Concorde was literally a case of design-by-committee, namely Britain's Supersonic Transport Advisory Committee (STAC). Britain ultimately used the STAC's report to propose a joint project with France meant to signal interest in joining the European Common Market. Its mission was political, never to make money. The French and British had multiple disagreements and went through multiple redesigns, causing costs to soar from the initial estimate of £95 million. By the time the Concorde entered service in 1976 true costs came closer to £4.26 billion or $27 billion in today’s dollars. Production went ahead, and after several prominent test flights over 70 orders were placed by major airlines worldwide. Then the 1973 oil crisis hit, and airlines canceled orders in droves. In the end only 20 total Concordes were ever manufactured, of which just 14 saw passenger service. Government efforts into supersonic to date have favored large 100 to 300 seat passenger jets. Indeed, the U.S. and Soviet's SST projects were even bigger aircraft than the Concorde, and even bigger failures. In the Concorde's case, a large capacity made it extremely sensitive to fluctuations in demand. Many routes struggled to surpass 50% capacity, while other routes were shut down altogether. The lack of competitive pressure and soft budget constraints meant the Concorde simply didn't have to succeed, must less iterate to improve its design overtime. This was government's failure, not supersonic's. The ban on overland supersonic transport has played a significant role in delaying new supersonic developments in two main ways. First, as discussed above, the ban greatly restricts potential market size. And second, it closes off the business jet category as the natural entry point for the private sector to enter along supersonic's industry learning curve. The Boeing 2707 was so complex to build it never flew. Image credit. Everyone stands to benefit from supersonic transport. Nonetheless, early technological adoption among a luxury or business class of consumers is a recurrent phenomenon in the spread of innovation. As Everett M. Rogers showed in his seminal work, Diffusion of Innovation, early adopters are often willing to pay a high initial price for a new product due to greater resources and the pursuit of social status. From there, firms reinvest profits in product design and use the benefits of volume and scale to introduce subsequent product versions with more and more mass market appeal. This is how cell phones went from a luxury used by Wall Street's Gordon Gecko to being in the pockets of poor farmers in Africa. It's also the strategy Tesla Motors is using to mainstream affordable electric vehicles. The theory of industry learning curves is of such high importance to the aviation industry that it appears to be where the idea first originated. Climbing a learning curve is like climbing a mountain. Government efforts like the Concorde or the Boeing 2707 failed because they attempted to go from the base to the top of the mountain in a straight path. Instead, industries with learning curves require trial and error in order to find the few paths up the mountain that don't run into dead ends. A market in supersonic business jets would be able to iterate on low boom and cost saving technologies while learning exactly what routes the market will bear. Only then would passenger capacities increase for the routes with the highest demand, eventually working up to full size passenger jets that bring truly affordable supersonic transport to the masses. Emissions from supersonic transport have raised concerns due to its high cruising altitude. The Concorde, for example, flew at 60,000 feet, placing it in the lower layers of the stratosphere roughly where the ozone layer begins. Further study is warranted to assess the environmental impact of larger, high altitude SST. Nonetheless, the evidence to date, including 27 years of Concorde operations, indicate that passenger SST ozone risk is well within the realm of acceptability. Simulations conducted by NASA Glenn Research Center have considered the effects of a fleet of supersonic business jets over a ten year period within the atmospheric conditions projected for 2020. A total of 24 scenarios were evaluated by varying parameters like fuel burn, cruise altitude and a nitrogen oxide emissions index. The most probable scenario considered a fleet of supersonic business jets burning 18 million pounds of fuel per day at a height of 15-17km, or roughly 50,000 to 56,000 feet, resulting in a maximum local ozone depletion of only 0.038% and a rate of global ozone depletion orders of magnitude smaller. For comparison, concern in the 1990s that pollution was creating a growing “hole” in the ozone layer stemmed from observations of ozone depletion on the order of 20-60%. In fact, emissions in the lower altitude range of 13-15km may actually create ozone on net, although at a similarly small rate, through a process related to the phenomenon of urban ozone. Supersonic business jets are thus considered essentially ozone neutral within their range of likely cruising altitudes. That did not stop anti-Concorde activists from propagating false and exaggerated claims of ozone risk. As supersonic researcher Preston A. Henne put it, “The difficulty in early programs was lack of credible understanding of atmospheric science. The absence of such knowledge left the door open for wild and exaggerated claims of atmospheric trauma based on speculation, misinformation, and political agendas.” Atmospheric science has advanced significantly since the 1970s, and today, it is widely accepted that emissions from supersonic aircraft in the lower stratosphere pose minimal risk to the ozone layer. As supersonic transport overland becomes liberalized it will come to fall under at least six distinct sources of existing environmental regulation, including local air quality certification standards, airport noise rules, and the Montreal Protocol on ozone pollution. In general, these regulations were not designed with SST in mind, meaning they may require updating with appropriate consultation from federal agencies like the EPA and international bodies like ICAO. Clarifying the environmental status of overland SST under existing regulation is an essential step for creating the conditions of policy certainty the industry needs to thrive, however this does not mean any new regulations are required. Governments have a role in requiring consumers to internalize the social cost of their behavior, including nitrogen oxide and carbon emissions. But as long as the cost is accounted for the law should remain neutral with respect to how the emissions are created. This is the reason economists favor policies like carbon taxes to ad hoc prohibitions on carbon-intense goods or services. 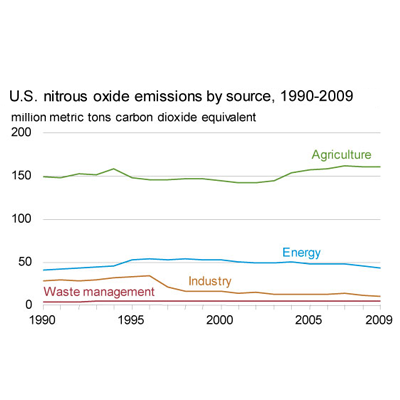 Agriculture is the overwhelming source of N2O emissions. Jets reduce noise by by-passing air around the engine. Modern supersonic passenger jets will be both quieter and dramatically more fuel efficient than the Concorde. Indeed, the Concorde's turbo jets were very noisy independent of the sonic boom, and its use of afterburners on take-off was incredibly wasteful and dirty. Modern aircraft engines are capable of reaching supersonic speeds without afterburners, and by-pass air around the jet in order to insulate noise. Subsonic passenger aircraft have met airport noise standards by increasing their bypass ratio, at the same time producing a huge gain in fuel efficiency. The more air the engine lets bypass the jet, the higher its bypass ratio, and the quieter the aircraft. However, the relationship between air bypass and fuel efficiency runs in the opposite direction for supersonic aircraft. Supersonic engines have not experienced the decades of incremental improvement that subsonic engines have—thanks in part to the supersonic ban over land—and therefore it makes sense to set a slightly less stringent airport noise rule for supersonic transport, at least at first. It may therefore make sense to set a slightly less stringent airport noise rule for supersonic transport, at least at first. We currently tolerate Stage 3 airport noise standards, as they are known, but newly certified aircraft are required to meet more stringent Stage 4 noise standards. Ideally, a new supersonic passenger jet would be certifiable under the current Stage 3 standards until later designs are able to climb the noise abatement learning curve. Future solutions include variable by-pass engines that reduce the jet's by-pass ratio once the aircraft is beyond the ears of airport residents. "Rules are made for people who aren't willing to make up their own."